﻿ 4 Ways to Build Trust With Customers That Can Transform Your Business » Red Mango Marketing! « October 2016: What’s New With Constant Contact? Remember that tiny ad that used to run regularly in virtually every newspaper’s classified ad section? I suppose a fair number of people answered the ad, otherwise they would have gone extinct quite quickly. However, most of us didn’t take the bait. Why? Because we didn’t have any trust in it. Trust may be the single most important foundational element in a business relationship. And with so many business relationships starting online, knowing how to build trust with customers and prospects via digital media is essential for success. Not only do you need to communicate how your product or service solves the problems your prospects are having, you need to establish trust with them, as well. You probably know the objections prospects have to buying your product or service. Address those head-on in your marketing materials and on your website. The more honest and forthright you can be when you take on possible objections, the more your prospects will notice and appreciate it. Here’s an example of how Constant Contact addressed email marketing oppositions in a recent blog post: 5 Email Marketing Misconceptions that Could Be Holding You Back. Testimonials and reviews are a great way to build trust. However, there are a lot of companies on the Internet that fake testimonials. Be sure yours are legitimate. It’s great if you can use a customer’s full name and picture and even say a little about the product or service that your customer used. In other words, make it into a mini-case study rather than a one-sentence quote. Using a third-party review app gives your reviews a higher level of legitimacy. When they can be identified as actual buyers, their reviews carry a lot more weight with prospects. Take a look at how this Oregon hotel, Inn at Seaside, highlighted a positive TripAdvisor review on their Facebook Page. Getting influencers on board is a major trend today. There is even a growing movement of using “micro-influencers” — individuals who are recognized authorities in smaller niches. If you’re a local business, think about who the influencers are in your community. If you owned a sporting goods store, making a donation to a local team and posting a thank-you note from a respected coach would help build trust and esteem. Highlight these endorsements on your website and email marketing messages to build credibility. The About Us or About Me page is always one of the most-read pages of a website. That alone should tell you how important it is to build trust with customers and prospects — they are looking for reasons to trust you! Sadly, many businesses use this page as a sales page. They tell how dedicated they are to providing the best widgets or widget repair service in the world. It’s wiser to take a more personal approach. Let your customers and prospects see you and your team as real people. Talk about hobbies, families, and other interests. Talk about why you started your business and your vision for the future. Then, let them know how to learn more about the products you offer. Encourage them to keep in touch with you by joining your email list. Are you doing everything I’ve outlined here? If not, you need to get busy. These are not difficult steps to take, but if you’ve dropped the ball on any of them, you are undoubtedly losing some business. Finally, although I’ve concentrated on the image you present online, these principles apply to print media as well. Want to get really advanced? Check out these 25 Helpful Resources for Building Customer Relationships Online. 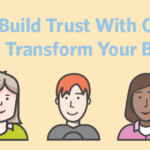 The post 4 Ways to Build Trust With Customers That Can Transform Your Business appeared first on Constant Contact Blogs. This entry was posted on Tuesday, October 4th, 2016 at 8:00 am	and is filed under Business Tips, Fresh Insights, News & Updates, small business marketing. You can follow any responses to this entry through the RSS 2.0 feed. Both comments and pings are currently closed.